Since Fussballwitwe.com’s language is German, usage of the site is of course limited to German-speaking readers, who by nature live mainly in Germany. 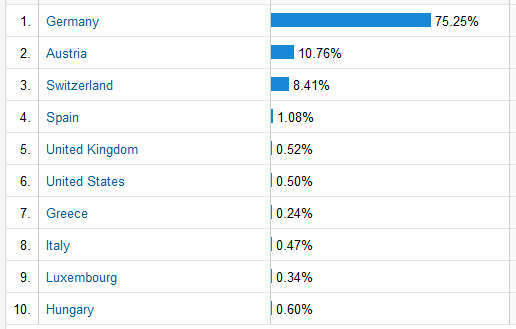 The adjacent screenshot shows visitor distribution over the last three months – Google Analytics shows 75.25% of Fusballwitwe users originating from Germany. It is nice that Firefox and Internet Explorer are widely used in Germany, hence why the Alexa figures come closer to the truth than for the English site, but their estimate of 87.30% users from Germany is still more than 12% removed from the truth. Webmasters, technical people, and internet geeks are perhaps not so common either in Austria or Switzerland, and therefore no visits from these countries are recorded in the Alexa estimates. How to Improve your Alexa Rank? Installing the Alexa toolbar in your own browser helps and can affect the ranking to a certain degree. Of course, it is then necessary to visit your own website constantly so that visits are transposed in Alexa. It also helps to visit individual pages within your site using Explorer, Firefox, or Chrome via a proxy server, especially if you would normally be accessing your site from a country which would exaggerate Alexa’s percentage distributions even more. Of course, this also applies in the other direction. There are plenty of companies who offer to buy Alexa visitors from advertisers’ targeted countries. Therefore, dishonest websites whose main traffic comes from countries which would be detrimental to their chances of advertising income, can purchase non-existent traffic, dropping their Alexa rank to a number far below 100,000, and manipulating the public display of supposed country popularity of their site. However, if you belong to the honest website owners, then encouraging friends to install an Alexa toolbar, or inviting regular readers to install the toolbar in their browsers, will certainly help to improve Alexa ranking in the right direction. You could change the subject of your website and write about things that interest webmasters and consequently, target visitors with an Alexa toolbar. Alternatively, you could start actively commenting in SEO forums including links to your site and hope that Internet-Explorer, Google Chrome,or Firefox visitors with an Alexa toolbar click on them. Of course, there is also always the option to open up a forum and attract millions of visitors (said she, tongue firmly in cheek! ), and then trust enough that Internet Explorer, Google Chrome, or Firefox visitors with an Alexa toolbar use the forum extensively. Although Alexa ranking and Alexa published visitor behaviour information are both clearly and evidently pointless for sites which do not attract the right group of visitors (with a toolbar), there are many, many ad agencies relying entirely on Alexa data and basing their decisions on these. Therefore a website operator has little choice but to pay attention to their own Alexa ranking, and to continually improve the position, if he is serious about wishing to earn any money with a website. Maybe it helps, now and then, to publish your own statistics and hope that some reasonably minded agency takes the time to read them, and also hope they then base their decisions on real numbers rather than on Alexa’s extremely inaccurate data. In summary… Soccerwidow / Fussballwitwe had more than 2,000 visitors a day (as at end of October 2013) with the majority of visitors from advertiser preferred countries like the United States and the United Kingdom. Even if this is not apparent from Alexa (just in case any prospective advertiser or agency is reading this article! ), Soccerwidow has a stable, well targeted audience comprising more than 60% of its traffic from the US, UK, Canada, and Australia! How to solve the issue of false perception caused by erroneous data published by Alexa is definitely a tough nut to crack, and at the moment I cannot think of any brilliant ideas or solutions. We are not alone! In January 2012, SEOmoz.org reported 13.8m visits from 6.25m unique visitors for 2011. Those numbers were pretty exciting, but what was damaging was the external perception created by third-parties like Compete, Alexa, Quantcast, Doubleclick, and Google Trends. These sites reported massively wrong trending data. Dear Soccerwidow, i own a fashion and style blog based in Delhi, India. We enjoy tremendous respect and good traffic considering fashion blogging is in a nascent stage in Delhi. My Google Analytics shows 200,000 approx page views with only a 40% traffic from India, the rest are from foreigners with the next biggest readership from USA. However i was told yesterday that the Alexa ranking of Delhi Style Blog.com is pathetic, and the Digital Marketing guy doesn’t believe my statistics. Your article made me understand how this could happen. However i am quite happy with my honest organic growth, is it really important for me to pay attention to facilitating a better Alexa rating ? Unfortunately, although it is well known that Alexa ranking is highly inaccurate, the marketing (especially advertising) world pays a lot of attention to it. It certainly helps to install the toolbar on your own computer and to use various proxy servers and different browsers to surf your own site. Encouraging friends to do the same may also help. However, this is a pretty time-consuming exercise and you need to decide if it is really important for you to pay attention to Alexa or not.